Caretaking a Ranch in Northern New Mexico. 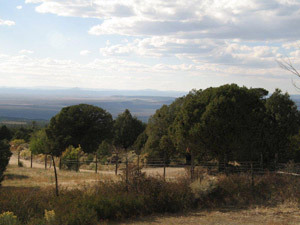 Through the generosity of Eya Fechin, daughter of Russian artist Nicolai Fechin, Steve lived and worked as a caretaker on the Branham Ranch – now the Donner Ranch – in San Cristobal NM in the 1970s. While Steve lived on the ranch, he acquired basic carpentry and general maintenance skills in exchange for room and board. The ranch is now under the wise stewardship of Eya’s daughter Nikki and her husband Mark Donner. After leaving New Mexico early in 1976, Steve planned a solo bicycle trip through England. He shipped his bicycle and himself to New York where he caught a flight to Heathrow International Airport just outside of London. After landing, he retrieved his bicycle from Baggage Claim, pumped up his tires and rode into the English countryside. He concentrated his ride on southern England, visiting Stonehenge, Oxford, Stratford-on-Avon and Cambridge in three weeks time. His routine was simple: ride in the morning, find a place to stay early in the afternoon (usually a pub or bed-and-breakfast), and explore the neighborhood for the afternoon and evening. I would then go to bed early and start all over again the following day. After completing his bicycle adventures in England and the Netherlands, he parked his bicycle in a bicycle parking garage in Den Haag, and then eurailed throughout Europe. Visited the Eiger in Switzerland, the Costa del Sol in Spain, as well as Paris and Amsterdam. Steve has made libraries a significant part of his world since his high school days when he was a Page at the Des Moines Public Library. He continued his library ways – it was not yet a career – at the University of Iowa where he worked in the Medical, Speech Pathology and Pharmacy Libraries his junior and senior years. After receiving his Bachelor’s degree and a Masters degree from the University of Iowa, Steve’s first job after receiving his MLS was as the director of Taos, New Mexico’s Harwood Foundation of the University of New Mexico. The Harwood Foundation of the University of New Mexico served as the only public library in Taos County and also housed an art museum featuring works by most of the major artists who lived and worked in Taos. Steve was director there from 1972-1976. In 1975 and 1976, Steve was appointed Visiting Lecturer at the University of Arizona’s School of Information Resources and Library Science. Here he taught Basic Reference, Library Administration and Trends in Library Service. After a three-year stint as road manager in the music world (see below), Steve turned his focus back to his library career. He served at the Des Moines (IA) Public Library as a Film Librarian from 1979-1980, and as Head of Fine Arts from 1980 to 1990. 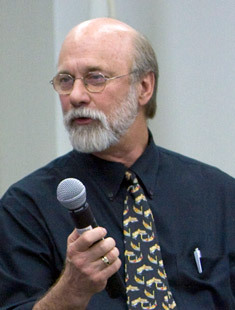 Afterward, he served at the Thousand Oaks (CA) Library as Deputy Director from 1990-2000, and as Director from 2000-2014. He made a return back to the academic world in 2010 when he was appointed to be Adjunct Professor for the Los Angeles cohort of the University of North Texas. Here he teaches “Advanced Management of Information Agencies.” This UNT program is held in conjunction with the Cal State University Northridge. Certainly the high point of Steve’s career with the Thousand Oaks Library was the planning, construction and opening of the 22,000 sq ft Childrens Library. Complete with a 4,000 gallon salt water aquarium, the Children’s Library is a reminder to the children of Thousand Oaks that their lives matter, that the city cared enough about them to construct this beautiful library just for them. Steve used to maintain a web site for Bill & Bonnie Hearne. Bill has his own web site now at www.billhearne.com, but we’re keeping the old site here for historical purposes. Steve made a note of this and went to hear Bill and Bonnie every time they came to Taos or Santa Fe. One time he asked them over for dinner. They came and a friendship began that has lasted until this day. Three years of listening to live music four nights each week planted a seed in Steve’s subconscious. Years later, in 1997, when Bill and Bonnie secured the services of grammy-winning producer Jim Rooney to produce their “Diamonds in the Rough” CD, Steve agreed to help produce a web site for them. He has continued to help with their web presence to this day. 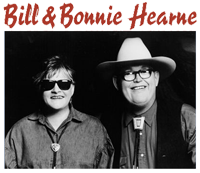 On tour in 2007 to support the release of “Diamonds in the Rough,” Bill and Bonnie opened for Lyle Lovett at the Greek Theater in Los Angeles. They invited Steve to join them for the day. He did so and, at one point, he and Lyle were walking together down the backstage stairs. Lyle said to Steve, “You know Steve, I remember you from 20 years ago.” Steve replied, “Lyle, I’m embarrassed to say that I don’t remember you.” Lyle laughed and said, “Bill and Bonnie played the coffee house at Texas A&M and I was running that coffee house. You with them then, I remember you, and it’s good to see you again.” Needless to say, Steve is now a life-long Lyle Lovett fan. Another highlight for Steve was when Bill and Bonnie opened for Willie Nelson at the basketball arena of the University of Arkansas in Fayetteville. The house was full and Willie was gracious to everyone he met. Here Steve opens the Best of the West ceremony at the 2014 FAR-West annual conference, attended by over 300 people. In 2007, Steve attended a Bodie House Music concert produced in Agoura Hills (CA) by Renee Bodie. The following week he sent an email to Renee introducing himself to her. He explained his background with Bill and Bonnie and asked if she would be interested in moving her Bodie House Music series to the Thousand Oaks Library where Steve was the director. She consulted with Kenny Edwards, her dear compadre. He gave his ok to the room in the library where the concerts would be held and the series began. Music at the library continued until Steve’s retirement from the library in 2014. Steve’s “Live at the Library” series closed out with concerts by grammy-winner Albert Lee, grammy-nominated Perla Batalla, and Vonda Shepard, familiar to many through her recurring role in the TV series Ally McBeal. Steve often heard Renee speak about FAR-West (Folk Alliance Region – West). Steve asked her about FAR-West and, before he knew it, he was chair of the Best of the West committee, presiding at the luncheon at the 2008 FAR-West annual conference in which his childhood heroes, The Kingston Trio, were being honored. In 2011, Steve was elected president of FAR-West until he stepped down early in 2015. He remains on the FAR-West board of directors.